It is hereby notified that on the basis of the Main Examination held on 01/09/2017 (Music Teachers) and subsequent Certificate Verification process held on 09/02/2018 at Sankethika Vidya Bhavan, Masab Tank, Hyderabad and on 04/06/2018 at TSPSC Office, Nampally, Hyderabad for Direct Recruitment (General) to the post of Music Teachers in various Residential Educational Institutions Societies,113 candidates with the following Hall Ticket Numbers have been provisionally selected for appointment to the post of Music Teachers in various Residential Educational Institutions Societies Notification No.19/2017, Dt: 14/04/2017. The selections are published here-with subject to the following conditions. pending, if any, before the Hon’ble High Courts of law. 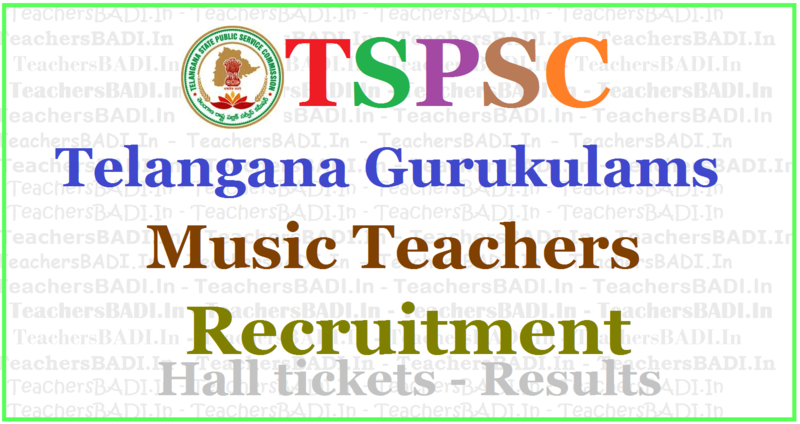 TSPSC Gurukulam Art Teachers, Craft Teachers, Music Teachers Web Options 2018: The candidates who have attended for Certificate Verification from 07/02/2018 to 09/02/2018 for the posts of Art, Craft and Music Teachers are hereby directed to exercise the Web Option for the various Societies and Zonal preference to the said posts from 02/05/2018 to 04/05/2018, failing which his/her candidature will not be considered for selection. Note: The candidates satisfied with earlier given web options may not give again. Please visit Commission’s website (www.tspsc.gov.in). which, they will NOT be admitted in subsequent process of selection. No request will be entertained for subsequent submission of any of the required certificates. In terms of the Notification, the candidate should possess the requisite qualifications as on the date of the Notification. The Commission reserves right to disqualify any candidate, if he/she is not found eligible for any reason at any stage. Admission to Verification of Certificates does not confer ipso facto any right for Final selection. 9) Disability Certificate (SADAREM Certificate) in case of PH candidates. The PH candidates have to undergo a medical examination at respective MedicalBoard. 14) 2 sets of Attestation forms duly signed by Gazzetted Officer. Sl. No. Name of the Post No. of Vacancies Age as on 01/07/2017 Min. Max. Scale of Pay Rs. EDUCATIONAL QUALIFICATIONS: Applicants must possess the qualifications from a recognized University/ Institution as detailed below or equivalent thereto, as specified in the relevant Bye Laws/ Service Regulations, indented by the Residential Educational Institutions Societies as on the Date of Notification. 2 Music Teachers in Mahatama Jothiba Phule Telangana Backward Classes Welfare Residential Educational Institutions Societies. AGE: Minimum 18 years & Maximum 44* years. The age is reckoned as on 01/07/2017 (Rule- 12(1)(a)(v) of State and Subordinate Service Rules). *As per G.O. Ms. No. 329 GA(Ser.A) Dept., Dt. 27/07/2015 read with G.O. Ms. No. 264 GA(Ser.A) Dept.,Dated: 26-07-2016, the upper age limit is raised up to 10 years. N.B. : 1) No person shall be eligible if he/she is less than 18 years of age. 2)No person shall be eligible if he/she crossed 58 years of age (Superannuation age). 2. Telangana State Government Employees (Employees of TSRTC, Corporations, Municipalities etc. are not eligible). 5 Years based on the length of regular service. 3. Ex-Service men 3 years & length of service rendered in the armed forces. 4. N.C.C. (who have worked as Instructor in N.C.C.) 3 Years & length of service rendered in the N.C.C. a) FEE: (Remittance of Fee) Each applicant must pay Rs. 200/- (RUPEES TWO HUNDRED ONLY) towards Online Application Processing Fee. This apart, the applicants have to pay RS. 120/- (RUPEES ONE HUNDRED AND TWENTY ONLY) towards Examination Fee. However, the following category of candidates belonging to Telangana State only are exempted from payment of Examination fee. Candidates can use the below link.. Eligible candidates may apply through online mode only from 20-04-2017 to 09-04-2017.
iv. The question paper will be supplied in English version only. Candidates are hereby informed that receiving of applications for all the posts, except Art Teacher post will be closed on 09/05/2017 and for Art Teachers post it will be closed on 11/05/2017. submitted and no subsequent changes can be made. Web-Note : Gurukul Teachers PostPonement of Examination Schedule: The candidates who have applied for various post in Residential Educational Institutions Societies are hereby informed that in compliance with the interim orders of the Hon’ble High Court in W.P.M.P.No. 29495 of 2017 in W.P.No.23837 of 2017 the following schedule of Examination stands postponed. It is hereby informed to the candidates that the postponed Exams for various posts in various Residential Educational Institutions Societies, will be re-scheduled and announced shortly, since the Hon'ble High Court vacated the stay orders on above recruitments. S.No. Date of Exam Post Notification No.